We were married in church with all the fuss of the time. The sister of the Tsar was present and the church was filled with Guards officers and high dignitaries. My vanity and pride helped me to choose the most handsome and tall best man so as not to spoil my hair when he held the crown above my head, which was the custom, and to be careful not to step on my very long train. From an early age, I always had a religious feeling. When I was seven, all the other children in our school were Russian Orthodox, but my brother and sisters and I had our religious lessons in German separately from the others. One day my mother told us sorrowfully that from now on a Russian priest had to teach us Holy Scripture in Russian, but I was unwilling for us to be separated in this way from my parents, so they finally decided to become Russian Orthodox also. Although her parents led a very active social life in high society, they gave a great deal of attention to the children. At the age of twelve Olga liked to play chess with her father when he came home from work. In their spacious apartment one whole room was a library, with books from floor to ceiling. There, in the evenings, her father would read aloud to them from Russian literature and, sometimes, from Goethe and Schiller in German. The family always spent the summer together in a property they had in Finland, inherited from their mothers uncle, who had been a great traveller. As they grew up, Olgas mother gave parties for the children and all their young friends. During these they played charades, danced, and improvised plays and operas. Their parents also took them often to the theatre and concerts, and to all the premières of operas and ballets. It was during the intermission at a concert featuring Thomas de Hartmanns music that Olga was first introduced to him. I had a funny feeling when I met him, she wrote, as if I knew him from long ago. In fact, the threads of connection stretched further than she knew at that time. During the reign of Tsar Alexander II there was a special commission in the government to organize the liberation of the serfs. The senior senator, who replaced the Tsar at meetings in his absence, was Olgas grandfather. Serving on the same commission was the General Secretary of the government, the grandfather of her future husband. From the time of their marriage, Olga shared in all her husbands activities. In the summer they now went to Thomass family estate in the Ukraine, where two of the younger servantschildren of older family servantsbecame their personal attendants and returned with them to St Petersburg, Marfousha as cook and ladys maid, and Osip as butler. Olga and Thomas became the closest of friends with Sergei Taneiev, the great teacher of counterpoint. 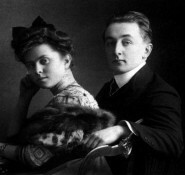 Olga had a lovely natural voice, and Taneiev advised her to take singing lessons from B. Curelli in Italy, which was arranged while she and Thomas were living in Munich and for which they went to Naples for several months. Later, when Taneievs opera trilogy Oresteia was being produced in Moscow, Olga sang a leading part. She also took lessons from the concert singer Zoë Lody in the repertoire of arias from Rigoletto, Lakmé, La Traviata and Madame Butterfly, and in a benefit performance of the Imperial Opera she was chosen to sing Violetta in La Traviata. At that time everyone was reading Blavatsky. One evening, with Kandinsky and some others, we decided to try running a plate with an arrow on it around the German alphabet, like a modern-day Ouija board. We asked it questions, expecting the plate to stop on letters which I had to write down and afterwards decipher. But nothing meaningful was spelled out. Someone suggested trying in Russian. Again we asked questions, and at once it became quite thrilling. A ghost told us her name, Musutsky, and that she had lived in the town of Ufa, near the border of Siberia, and was buried there. She asked us to pray for her and said that a cousin of hersshe began to spell his name: Sha, but here she was interrupted and got no further. Kandinsky decided to write to the priest in Ufa and ask him if he knew of anyone by the name she had given. In a months time he had the priests answer: there were among his parishioners many Musutskys, but there was only one with a relative by the name of Shatov. We were really astonished. The de Hartmanns began to look for some interesting and knowledgeable person to throw light on their questions, and they continued their search when they returned to St Petersburg. There they encountered various dubious groups, in one of which the leader sought to control the members by hypnotizing them. Thomas and Olga quickly left, together with another member of the group, Andrei Zakharov, who became their close friend. When war mobilization stationed the de Hartmanns at Tsarskoye Selo, Olga was alone all day while Thomas was on military duty. With a friend, she occupied her time by organizing and equipping a building there as a residence and school for some sixty boys, aged ten to fifteen, whose fathers were also reserve soldiers. A benefit concert, assisted by people from the Imperial Opera, helped her to finance this project. It was at this time that Thomas was talking privately with Zakharov and meeting Gurdjieff for the first time. Their book [Our Life with Mr Gurdjieff] picks up the story. The last chapter tells what she chose to write about the rest of their life together until Gurdjieff died in 1949. After her husband died in 1956, she continued tirelessly in her efforts to help supervise and support the development of Gurdjieffs Work in North America. As time allowed, she also promoted performances of her husbands orchestral and piano works, culminating in an oratorio-style presentation of his opera Esther at Syracuse, New York, in 1976. In later years, for health reasons, she moved to Nambe, near Santa Fe in New Mexico, where she died in 1979.